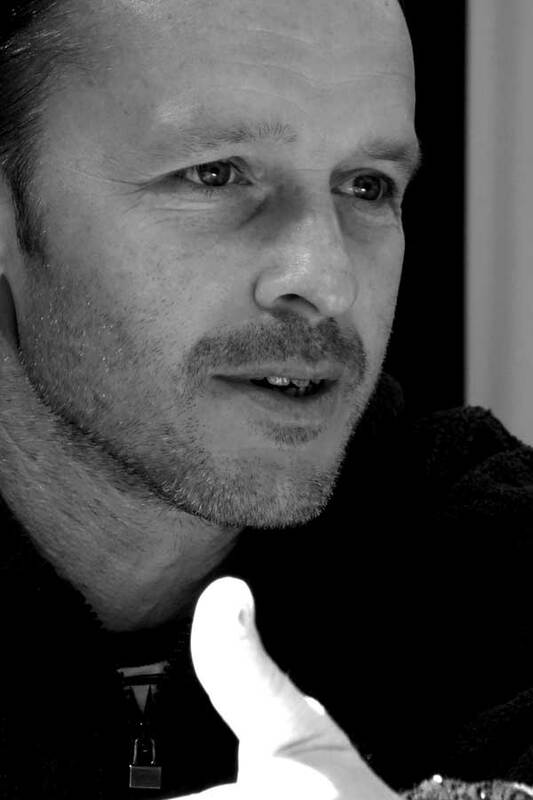 When Robert Wells – or Rob as he is widely known – moved with his family at nine years old from Tomlinson Close at the north end of Brick Lane to Nathaniel Close at the south end of the Lane, he was always cycling back and forth from his new house in Spitalfields on his BMX to visit his old friends in Bethnal Green. 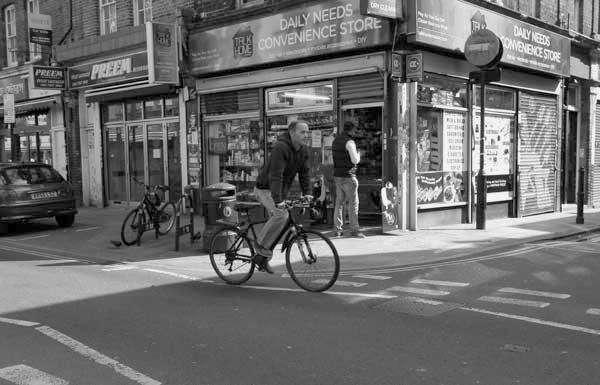 One day unawares, Rob cycled into the frame, as Phil Maxwell pressed the button and the shutter fell while Rob crossed the junction of Brick Lane and Princelet St – recording the moment for ever. Yet Rob did not know he had been photographed and Phil soon forgot the picture among the thousands he took of Brick Lane at that time. I met Rob when he introduced himself to me.“I’m the boy on the bicycle!” he said proudly. 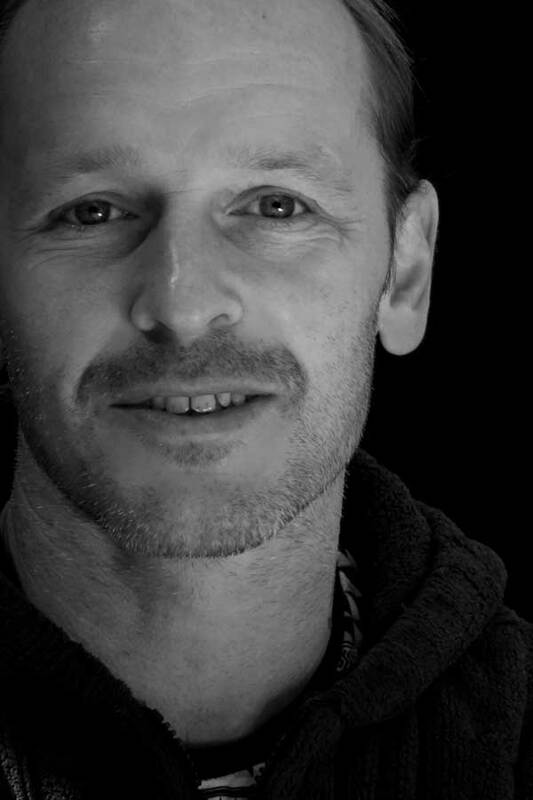 It was an astonishing encounter because at once I recognised Rob from his picture and I saw that he still possessed the same brightness of spirit today which Phil captured in the photograph thirty years ago. Realising this was an opportunity too good to miss, I asked Rob if he would be willing to collaborate with Phil Maxwell to reshoot the photograph and that is what we did at ten o’clock on Saturday morning. Brick Lane is a one way street and Saturday is the quietest morning, so I watched out for cars while Rob cycled up and down a couple of times, passing Phil standing on the corner of Princelet St. Thus we accomplished our task and you can compare the changes wrought by thirty years in the pair of photographs above. Once the business of the day was concluded, we sought refreshment and Rob revealed more of the background to the picture to us. “I wish I still had that bike. All my friends had bikes and we were always exchanging parts, so if someone got new wheels then someone else got the hand-me-downs. You’d go round to a friend’s house and they’d have all these spare parts lying around in the garden, and they were like little mechanics. My bike was a mish-mash of bits and pieces, it was probably a hand-me-down from my brother or friends. I used to go everywhere on it. I didn’t tell my mum, but I cycled all the way to King’s Cross to look at trains. Society has changed, children can’t do that anymore. One day, I went home to go to the toilet and left my bike outside. My mum said it was dinner time and I forgot about it, but half an hour later it was gone. Someone had nicked it – this must have been shortly after the picture was taken. When I was six or seven there was quite a bit of racial tension here. 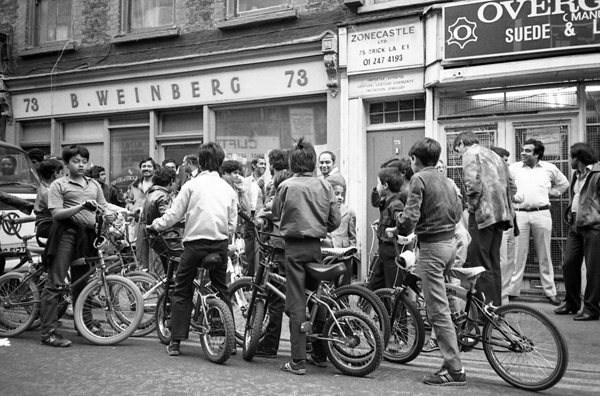 At the Bethnal Green end of Brick Lane, white kids were in the majority and they picked on the Asian kids but, when I moved to the other end, I got picked on by Asian kids – so I experienced both sides of the situation. In those days, if there was any piece of green, you played football on it and I ended up playing for the BYF – Bengali Youth Football. They said, ‘You can’t play for us, you’re white,’ but I said, ‘I want to play football, does it matter whether I come from Bangladesh or not?’ And that’s what I did. My mum had three kids with my dad – who was a champion boxer in Bethnal Green – but she left him because he knocked us about. One day he kidnapped us after school, and the police had to come and take us back. For a while, he worked in the amusement arcade next to McDonald’s in Bethnal Green and I used to visit him there. A lot of people I knew in my crowd when I was young got involved in hard drugs and ended up in prison or on the streets, but I turned out all right. I’m a self-employed builder and I only work when I please. I am my own boss and I have two daughters, Eliza and Darcy. 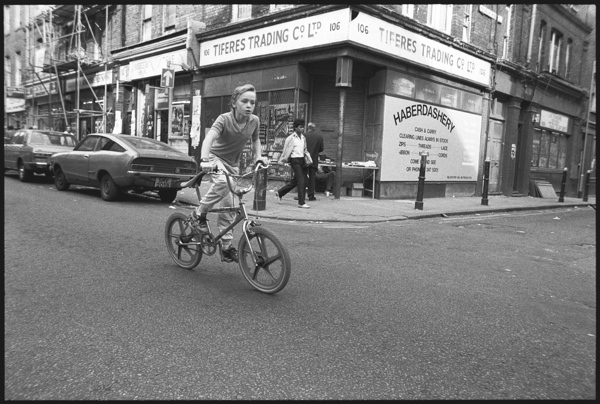 Rob may not live on Brick Lane any more but, thanks to Phil Maxwell, he will always be there as the boy on the bicycle because, on that day he cycled unwittingly into the photograph thirty years ago, he cycled into eternity. 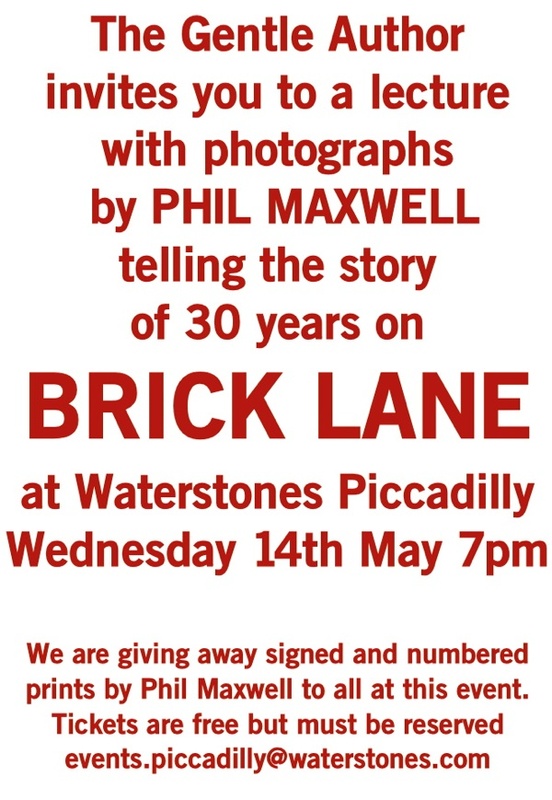 Phil’s book is exquisite, I saw it in Rough Trade East, when I had my Mother’s Day treat, visiting the Lane. I was disappointed that there wasn’t any details of the people behind the images -maybe I’m too nosey! Hence, I love this post – because this cover photo caught the soul of an area I have grown to love. It also caught the era – the year I got married and 20 years after Rob was born, our own son was born in the Royal London too. What a great story. I recall when you first posted that image , I wondered if anyone tracked the boy down and what happened to him. There is something so real and unplanned about this. Such a touching story! It was a MUST to find the boy on the cycle, for he is modern history! 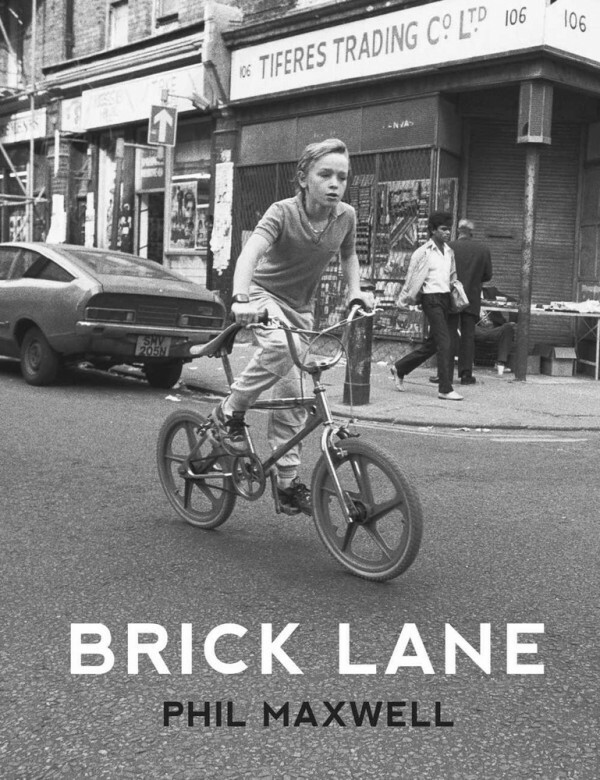 By the way: I love the Brick Lane book! You never know you might get your bike back! This article is good for attracting attention. We all yearn to go back in time. Good luck Rob! Looks as though Rob was a bit of a rebel – he was cycling against the one-way system in 1984! And whatever happened to all those cast iron bollards? I remember they were very common across London when I was young – they served a purpose and were an attractive and integral part of the street furniture. I suppose the council raised a few quid by selling them for scrap. Fantastic! I’ve been wondering since the day I first saw that photo who the boy might be. Is there really any reason why children can’t cycle around anymore? I grew up at the time of the Moors Murders and Mary Bell. There have always been dangers. We were allowed to roam far and wide. The children are not necessarily at danger from the old fashioned pervert in the shadows these days. Simply riding their bike into the wrong postcode could mean they lose their life at the hands of people of their own age. Terribly sad, especially as they tell us we have never lived in such peaceful times. great story, captured on celluloid and in a book too! Well done… I want that book!